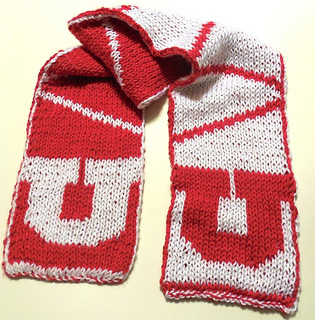 I have a friend who is a big U of U fan and though I bleed blue, I made this scarf for them. Now you can make it for the U of U fans in your life. It is a thick scarf, so do not use a stiff yarn, such as Red Heart Super Saver. Use a soft, flexible yarn instead, such as Caron Simply Soft and it works great. Note: You may not sell items made from this pattern unless you get permission from U of U to use their trademark.